For what is Pinterest used? Mashable gives several excellent ideas, but teachers have specific needs for their social media. 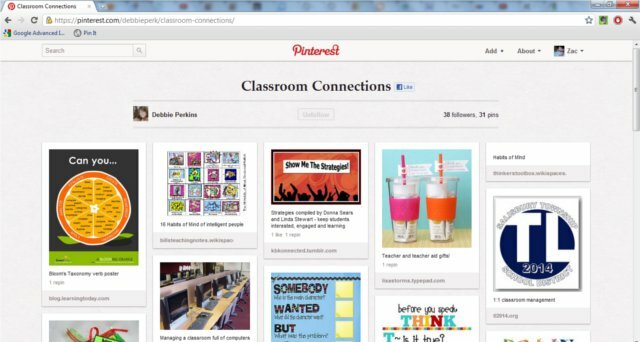 Pinterest could be used for organizational and thematic inspiration for their classrooms. Images of maps and primary documents could be collected. A Math teacher may create collections of how their content is manifested in the real world or English teachers could provide imagery to better illustrate the context and themes of literature. The possibilities are also endless for Science teachers as images exist all over the internet featuring scientific phenomena. Pinning is easy with the official Pin It Button, a simple drag-and-drop browser extension. When you come across an image you like, just click the button and select the corresponding picture. Assign the pin to a Board, add accompanying text, and you’re done. If the Pin is something you want to buy, include the price in the description and it will attach to the Pin for easy reference. If you find inspiration on the go, take a picture with your iPhone and add it to your Boards with the mobile app. (Sorry, no Android support at this time.) You can also Repin posts from other people. Mashable focuses on the social aspects of Pinterest next, but this fits well with our efforts to build community and use cooperative learning strategies. Students can share pinned items with one another, possibly using the tool to collaborate on research projects. Another social aspect that can be useful for students is to check for trending topics that might provide the latest information on a given topic. Even sharing a Pinterest account could allow students to share images that inspire or extend their learning. To start a Pinterest account, you can place a request but it takes a long time to be fulfilled. The best way is to ask a friend or coworker who already has a Pinterest account to invite you. What other ways have you used Pinterest? How might Pinterest best be utilized with students? How does Pinterest compare in your mind to other social media and bookmarking sites?